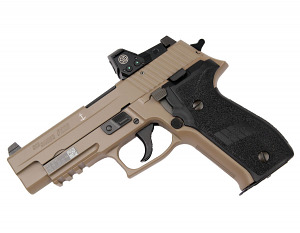 The railed P226 MK25 chambered in 9mm is engraved with an anchor on the left side of the slide and a UID label on the frame. This combat handgun combines the features specd by the Naval Special Warfare Group with the fast target capability of the ROMEO1 Reflex sight. The ROMEO1 Reflex Sight uses TruHold, a lockless system to maintain zero, and the MOTOAC (Motion Activated Illumination) system combined with co-witnessing suppressor height SIGLITE night sights for accurate hits round after round. Comes with suppressor height night sights, Romeo1 Reflex Sight, DA/SA trigger, 3 magazines, box, lock and manual.